Volkswagen stock has plunged 50%. Will it ever recover? Volkswagen has plunged 50%. Will it ever recover? Can Volkswagen survive the diesel emissions cheating scandal? Probably. Will its stock ever get back to where it was before? That's another story. Shares of Volkswagen have plunged nearly 30% since the news of the automaker's Clean Air Act violations first surfaced last Friday. The stock is now more than 50% below the 52-week high that it hit in March. The departure of CEO Martin Winterkorn on Wednesday is helping VW in the short-term. The stock has rebounded from the 52-week low it hit Tuesday. But one brand reputation expert said that VW has to act quickly to find new leadership. It's important to remember that Volkswagen was already in trouble before the term "defeat device" started trending on Google and social media. Excitement about VW's China business has also quickly turned into apprehension. VW car sales in China helped it surpass Toyota (TM) to become the biggest automaker in terms of global auto sales in the first half of the year. But China is now the financial equivalent of one of George Carlin's dirty words. China's stock market mess and economic slowdown started to take its toll on the stock over the summer. So what now? It's hard to imagine how VW can quickly recover. On Wednesday, credit ratings agency Fitch warned that it may downgrade Volkwsagen's debt due to the scandal. Fitch said its biggest concerns were the "reputational damage" to the VW brand, a likely hit to the company's profits and that the company's corporate governance is weaker than its main rivals. It's also unclear just how much the emissions scandal will cost VW. The potential recall of 11 million vehicles worldwide will be ridiculously expensive. And the lawsuits against VW are predictably starting to pile up. 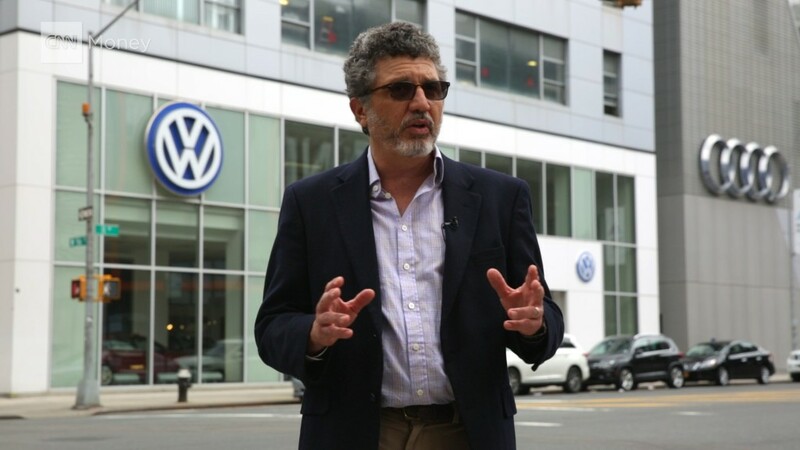 JPMorgan analyst Jose Asumendi downgraded VW's stock to neutral on Tuesday. He warned in his report that it's possible VW's liabilities associated with the scandal could be as high as 40 billion euro ($45 billion) -- although he noted that's the most pessimistic forecast. Still, a quick look at some other companies that have had to deal with big scandals (including two other major automakers) in the past few years shows that it's possible to rebound. It will just take some time. GM's (GM) stock is still below the level it was trading at last February before it issued its first recall tied to faulty ignition switches -- although shares have been highly volatile in the past few months along with the broader market. The stock peaked at $39 this March -- which is actually 20% above where it was trading before GM's recall problems began. So you could argue that GM has recovered from the worst of that scandal already. Toyota's stock tumbled shortly after it started recalling cars in November 2009 due to a problem with unintended acceleration from sticky gas pedals. But shares were back at pre-November 2009 levels by early 2011 . And it's worth noting that people actually died because of the problems in GM and Toyota vehicles. VW's scandal essentially amounts to trying to get one over on regulators. There are no safety concerns as of yet with its diesel engines. Other scandal stocks outside of the auto industry have bounced back too. There were a lot of people who thought BP (BP) would never recover after the Deepwater explosion in the Gulf Of Mexico that killed 11 workers and led to a massive oil spill. But BP eventually climbed back to its pre-Deepwater levels by June 2014. Of course, oil prices have since collapsed. And so has BP's stock again. Finally, Goldman Sachs (GS) only needed a few months to recover from the hit its stock took in April 2010 after the SEC accused it of fraud for how it sold and marketed supbrime mortgage securities. So VW is not necessarily doomed. But it needs to act swiftly and decisively. GM CEO Mary Barra, for example, has won praise for taking responsibility early on in last year's recall crisis. VW needs a new leader to do the same. CNNMoney's Mark Thompson contributed to this story.